Hanoi (VNA) – President Truong Tan Sang said he hopes the World Bank (WB) will support Vietnam in coping with the prolonged salt intrusion in the Mekong Delta during a meeting with WB Country Director to Vietnam Victoria Kwakwa in Hanoi on March 30. He briefed the WB official, who came to bid farewell at the end of her tenure, about the developments of drought, salt intrusion and climate change in the delta, which has caused huge damage on the local economy and lives. The President also mentioned the national programme on planning canal and dyke systems to prevent salt intrusion in the delta’s cities and provinces, and proposed the WB give urgent support to the country in these projects. He thanked the WB and Kawkwa in particular for supporting Vietnam, especially in its difficult period, saying that WB projects have helped Vietnam reduce poverty and fulfill the millennium development goals, and brought about a socio-economic facelift to many Vietnamese localities. The State leader added that Vietnam needs more financial resources to implement its sustainable growth targets, of which the WB assistance is enormously useful. He said he hopes, in addition to financial support, the WB will continue to help Vietnam with policy consultation and international experience in policy making. Kwakwa confirmed the WB will continue to coordinate with the Vietnamese ministries, sectors and localities to put forth effective measures to cope with climate change. 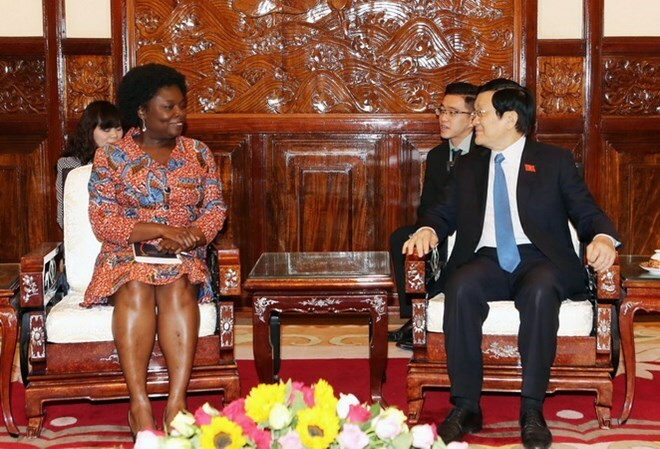 She called on Vietnam to cooperate with the bank in implementing its upcoming major programmes, and proposed that the President authorise agencies to negotiate on rural transport projects, dam safety, credit management, and budget cuts.